US President George W. Bush and Iraqi Prime Minister Nuri al-Maliki, 2008. Deploying a ‘Bourdieusian’ approach to explaining the rise of sectarianism within Iraq’s political field after 2003 involves identifying and explaining the rise to dominance of sub-state communalist ‘principles of vision and division’, that ‘limit the universe of political discourse’. The principle vision through which the US sought to understand and transform Iraq had two aspects to it. The first was a transformative Neoliberalism. 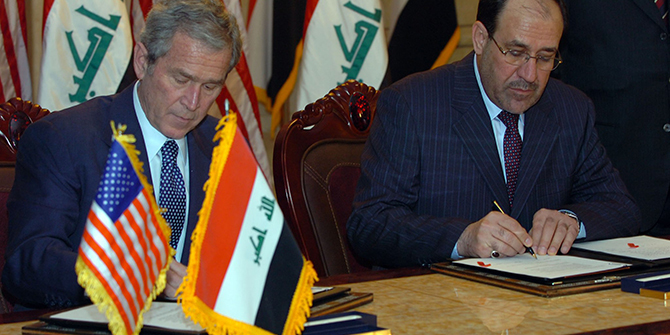 The second aspect of the Bush administration’s vision was how Iraqi society was understood. Across Central Intelligence Agency reports, National Security Council briefing papers, documents drawn up by both the State Department and Defense Department, Iraq was perceived of as irrevocably divided along ethnic and religious lines between homogeneous and mutually antagonist communities of Shi’a, Sunni and Kurd. This sectarian trope dominated American perceptions of Iraq to the exclusion of almost anything else. The Iraqi principle vision that came to dominate the country after 2003, the muhasasa ta’ifia or sectarian apportionment system, was largely developed in exile in the early 1990s after Iraq’s invasion of Kuwait. This assertion, in exile, of a principle of vision that reordered and divided Iraq’s political field along identitarian lines reached a peak of coherence at an opposition conference held in Salah al-Din, an area of northern Iraq recently liberated from Baghdad’s rule, in October 1992. The 234 exiled politicians present at the event established a number of councils and committees that were to act as a unified opposition and government in waiting. Most importantly, positions on these governing and planning bodies were allocated according to the ‘Salah al-Din principles’, the division of jobs according to the conference’s assessment of the percentage of the population which were Shi’a, Kurdish and Sunni. It was this principle of vision, brought back to Iraq in 2003, that ordered its political field. This was imposed through the establishment of the muhasasa ta’ifia system and electoral mobilisation in the elections of 2005, 2010 and 2014. The muhasasa ta’ifia principle vision restructured the political field and the state, empowering politicians who were championing sectarian identities as the dominant way to reclassify the social world. The use of the muhasasa ta’ifia system to divide up the institutions of the state, tied access to the state’s economic capital to the parties asserting sectarian identities. The Iraqi Governing Council, formed in 2003, the interim government of 2004, and governments formed after each national election, in 2005, 2010 and 2014 were all shaped by the the muhasasa ta’ifia principle vision. This dictated that the cabinet was divided, and ministries and their resources were awarded to the ethno-sectarian parties as their reward for mobilising voters along ethno-sectarian lines and then taking part in governments of national unity. Each party would then exploit the resources of the ministry they were awarded to gain economic capital in their struggle to dominate the political field. As a result, access to government employment, still dominant in the Iraqi job market, was only guaranteed by pledging alliance to one of the political parties promoting the muhasasa ta’ifia. As such, Iraqis seeking government jobs were interpolated as members of exclusive ethno-sectarian communities, Sunni, Shi’a or Kurd, with their habitus being socialised through the muhasasa ta’ifia principle vision in return for access to economic capital. In addition to the muhasasa ta’ifia principle vision imposing a sectarian symbolic violence on Iraq’s political field, electoral mobilisation also drove the increase in sectarianism. During 2004–5, Grand Ayatollah Ali al-Sistani developed a plan to maximise Shi’a representation in the Iraqi parliament after the January 2005 elections. He set up a six-man committee to choose candidates for the electoral coalition that fought the elections. The result was the United Iraqi Alliance (UIA), an overtly Sh’ia coalition which held within it all the Shi’a Islamist political parties and a large number of independent politicians. The rules under which the elections were fought exacerbated this dynamic, creating one nationwide electoral constituency. Local issues and personalities were minimised during the campaign, politicians and parties were marshalled into large coalitions, and candidates played to the lowest common denominator, deploying ethnic and sectarian rhetoric to define and then mobilise their constituencies. The electoral campaign itself was shaped by the deployment of Sistani’s cultural, symbolic and social capital in the UIA’s fight to win. The Shi’a section of the electorate were hence powerfully interpolated and mobilised to vote not only and exclusively as Shi’as but Shi’as who were to be represented in parliament and government by Islamist political parties. Electoral turnout for the December 2005 elections rose from 58 to 79.6 percent, indicating that the Sunni section of Iraq’s political field had also now been successfully interpolated on the basis of their sectarian identity and hence integrated into the muhasasa ta’ifia. The main electoral alliance involved in this process, the Accord Front (Jabha al-Tawafuq al-Iraq), was built around the Iraqi branch of the Muslim Brotherhood, the Islamic Party (IIP). The third national elections of 2010, saw the first sustained challenge to the muhasasa ta’ifia system. Iyad Allawi, the leader of Iraqi National List (Iraqiya), set out to capitalise on a new fluidity in the struggle to dominate the political field. Allawi built Iraqiya’s principle vision around its lack of contamination by the sectarianism and corruption central to the muhasasa ta’ifia since 2005. Iraqiya’s principle vision also promoted an overt secular nationalist politics. It set out, as key part of its electoral campaign, to interpolate and mobilise the Iraqi electorate as secular Iraqi citizens. Iraq’s newly competitive political field and Allawi’s successful accrual of both social and symbolic capital, meant the election delivered a three-way split, with Iraqiya winning 24.7 percent of the vote, Nuri al-Maliki’s State of Law, 24.2 percent and the Iraqi National Alliance, 19.2 percent. However, Nuri al-Maliki, the then-Prime Minister, managed to use the systemic threat of Iraqiya’s vote to impose a rough and ready unity on the Kurdish and Shi’a parties, who had a great deal to lose. Allawi and Iraqiya were brought into yet another government of national unity. The muhasasa ta’ifia, with its reassertion of sectarian identity, its defence of elite interests, its encouragement of both personal and political corruption and government incoherence, once again triumphed. Cabinet posts and the resources they brought with them were divided between the winning electoral coalitions. This was once again justified in the name of sectarian quotas. By bringing Iraqiya into another government of national unity on the basis of the muhasasa ta’ifia’s principle of vision, the rest of Iraq’s governing elite hoped that the threat it posed would be neutered. Iraqiya could now be treated as just another communalist party, replacing Tawafuq as the representatives of the ‘Sunni’ vote. The arguments developed have sought to move beyond the instrumentalism central to the sectarianisation thesis. For example, although Grand Ayatollah Ali al-Sistani has long been deeply committed to a unitary political field in which a civic Iraqi nationalism was meant to marginalise sectarianism, his backing of the UIA as a vehicle for Shi’a empowerment inadvertently led to the interpolation of Shia’s as Shia’s and increased the sectarianisation of Iraq’s political field. The US played a major role in the sectarianisation of Iraq’s political field but they did so because they believed they were working with social divisions which already existed not actively creating and then institutionalising them. A ‘Bourdieusian’ explanation to the rise of sectarianism in Iraq does not seek to discount the explanatory veracity of both the sectarianisation thesis nor the ‘culturalist’ approach. However, it seeks to broaden out the explanation and understand the causality behind it. Unlike the ‘culturalist’ approach, a Bourdieusian one sees identities as relational, created, shaped and then mobilised by the interaction between people and institutional and ideational structures they encounter. Under this analytical rubric, the sectarian rhetoric that flourished in Iraq after 2003 was not a return to nor a rejuvenation of previous identities suppressed under Ba’athism. Instead, the success of sectarian entrepreneurs was driven by the way that the political field being fought over was transformed by the invasion and its aftermath. What was ideationally attractive at times after 2003 was therefore the result of that transformation not a continuum of events before it. At the centre of this explanation is the principle of vision and division used by Iraqi politicians in their attempt to order and dominate Iraq’s political field. This principle of vision was clearly deployed instrumentally by agents competing in Iraq’s political field. However, the actions of those agents were also shaped by the principle vision they were working within, their own agency was constrained by the ideational structures, the symbolic violence they were deploying. Ali Allawi, The Occupation of Iraq. Winning the War, Losing the Peace (New Haven: Yale University Press, 2007).